Some thoughts, and data, on the blackout of 2003, influenced by the perspective of my recent work on long-term energy planning issues. August 14, 2003 had the 3rd highest daily peak of the summer of 2003 - peaks were higher in the winter back in 2003 and 2004 - unlike today. Many of the articles written a decade after the blackout pretend it was primarily an Ontario event largely driven by a supply shortage, despite widespread acknowledgement it was a cascading failure starting in Ohio. It's important, for future planning, to address some of the issues being raised, generally by lobbyists, about that blackout. We were importing at the time of the blackout - importing about 2130MW. 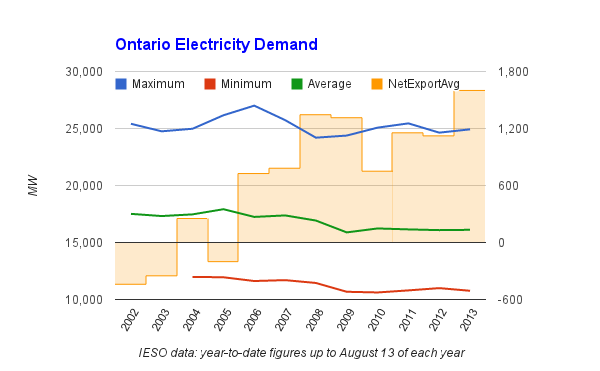 Our neighbour, Quebec, has a winter peak of around 37,000MW and Ontario has a summer peak of about 25,000MW. It's not clear to me it is bad to expect to be an importer during peak summer periods. It is, in my opinion, irresponsible to claim importing was an issue when it was not, partly because it may be that peak summer demand should be met with imports. Not that in 2003 the idea was to count on imports. 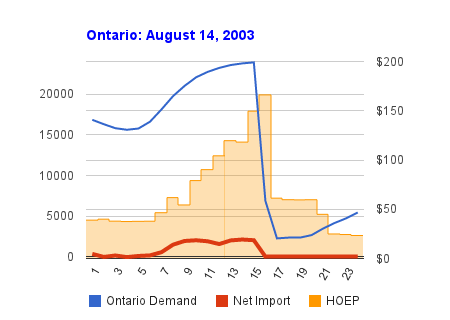 In my previous post I quoted the 1993 head of Ontario Hydro stating, "In light of our current surplus capacity, which we project will continue for the next 10 years ...." Ontario Hydro had later stopped 7 of it's nuclear reactors, but the government was hopeful a number of them would be back in service for the summer of 2003. Unit 4 of Pickering A returned to service in September 2003, Bruce A's unit 4 followed in November 2003 and unit 3 followed in March 2004; altogether these reactors provide approximately 2000MW of capacity - essentially equalling the imports at the time of the blackout. There are other articles that note a contribution from conservation in avoiding more cascading blackouts since 2003. Conservation may be contributing, but the numbers show that while the annual demand is now lower, 2013 actually has experienced a higher peak demand than 2003. Other IESO data indicates that roughly 2/3rd's of the decline in annual consumption is due to the wholesale sector - presumably dominated by a dwindling industrial sector. There are more households/people, so there is a real reduction in per capita consumption - but the reduction is primarily ouside of peak demand periods. Just as the issue with tight supplies in 2003 was primarily high emissions from the fossil fuel plants, the issue with conservation may be it is most effective in the periods it is least necessary. a reliable grid is probably more important than plentiful domestic supply. The IESO figures aren't actually for demand but supply,and the figures greatly underestimate demand this summer because they don't capture much of the newer wind generation, and absolutely no solar generation is included.